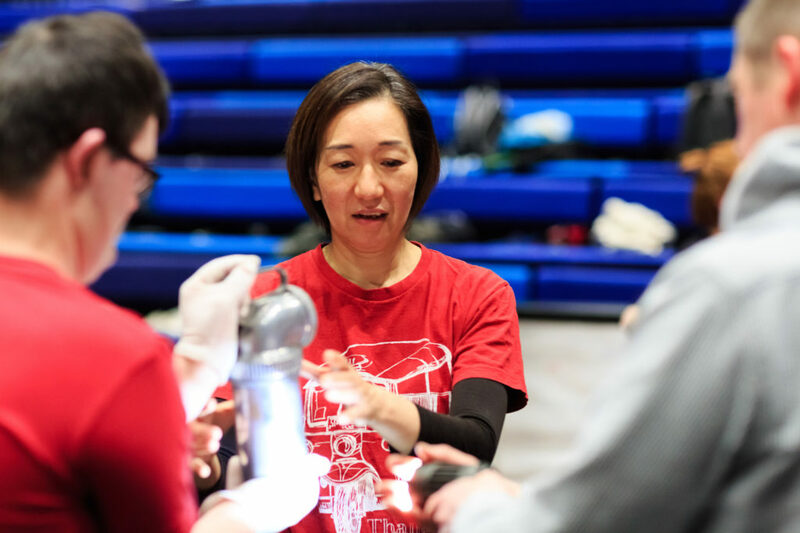 What happens when twenty Deaf and hearing volunteer dancers, a visual artist, a musician and international deaf dance choreographer Chisato Minamimura come together for a week in Newcastle-upon-Tyne? Lisette Auton went to the sharing performance of Hand in Hand on the evening of 22nd March at Dance City to find out. 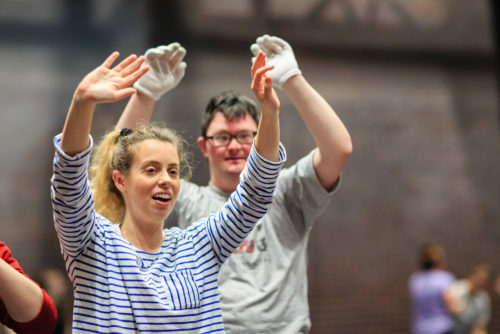 Fresh from a Guest Editorship highlighting Disability Arts in the North East, Hand in Hand was a collaboration supported by Surface Area Dance Theatre, Rory Studio, Moving Art Management and The Japan Foundation, that I really wanted to witness. The performance space was a large square, with black flooring and rows of raked benches for the audience. At the back of the stage was a full length floor to ceiling projection screen which showed a moving black and white circle which looked like it was formed of smoke and bubbles. There was the noise of dripping and a deep rumble. 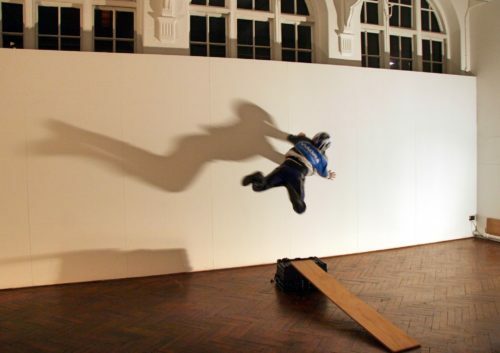 The absolute integration of the work of visual artist Graham Patterson and musician Tom White was set up from the start. The dancers stood against the wall stage left, black trousers, white tops. They had a long time to wait as the full house filed in and then producer Nicole Vivien Watson and choreographer Chisato Minamimura took to the stage with interpreter Amanda Fraser. The entwined history of Newcastle and its links to Japan were played out through dance, as well as visual and music interpretation. The dancers moved in groups of three or four across the stage showing the mining heritage, the stomp and vibration of their feet on the floor, their silhouettes against the scratchy grainy grass of the projection, which played with scale, made you look up at the huge figures and then back to the dancers on stage. The strength of this piece was in collaboration and accessibility which was integral right from inception and this played beautifully on stage – there was no BSL interpreter as add-on. In moments of text there were always two performers playing back and forth with each other, one using stunning flowing BSL and the other spoken English, with points of joint signing which would flow back into or out of the dance. There were intimate moments, a narrator telling us about the closing of the mines as metal poles were lowered from a rig above the stage so they floated at shoulder height. Two dancers moved through the space with their own poles, tapping them so they were spinning and dancing with the dancers. The most powerful visual moments were when the company moved as one with the music and visuals. In one example, three dancers laid on their backs, winding with their legs and arms and began to turn the line of dancers across the stage. In another – and one which the audience spoke most about over drinks afterwards – was the hypnotic and stunning movement in which the dancers became the hull of a ship by placing hands on each others shoulders. 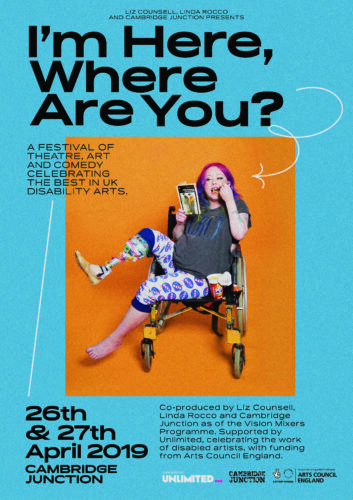 In the post-performance discussion I was really interested when Tom White, the musician, spoke about their experience, how it had been a challenge to their practice as they had never worked with a Deaf choreographer before. How they had to explore ways to make cues work for both hearing and Deaf dancers, how they mixed sound live throughout the performance to take cues from the dancers, and how they experimented with low frequency sound so that within the space it was not only heard, but could also be felt. This for me exemplifies one of the powers of Disability Arts; and the challenge to artists to learn to create in ways that are new to them to allow accessibility and how this pushes their artistry. What the artistic process had meant to the dancers was highlighted by all who spoke in the sharing, how it had been such a team effort and as a group they had worked on ways to communicate and ensure everyone had a voice, that no one was left behind. Not only did they feel that as a team, but that’s what the overarching feeling was when watching Hand in Hand, their solidarity and trust, that in the space of a week they were a group of people of different ages, backgrounds, dance abilities, both hearing and Deaf, who came together to be a company of performers who looked like they had been performing together for years.